This is the second issue in a row that contains no new stories and features only reprints. I have some thoughts on that, but, first, let’s examine the reprinted stories. 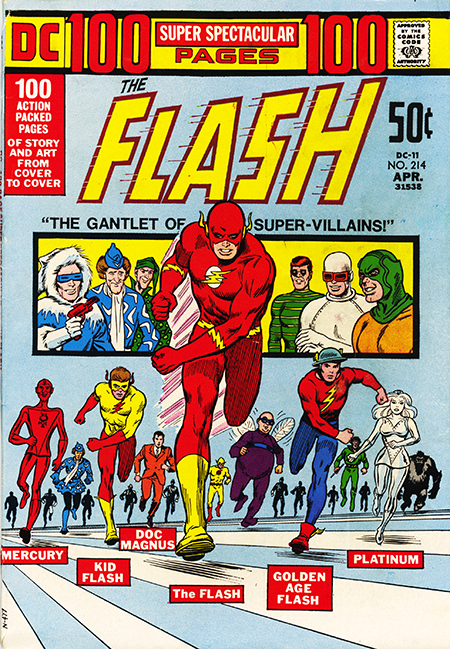 The reprinted Flash stories include the following: The Gantlet of Super Villains from issue #155, The Face Behind the Mask from issue #122, and The Weather Wizard Blows ups Storm from issue #145. Fine stories all, but stories all seen before. Then there was a reprint of a story featuring a character called Quicksilver from National Comics #67 Aug., 1948, a Johnny Quick reprint from Adventure #179 Aug., 1925, a Golden Age Flash story that they claimed had never been published, and, most curiously, a Metal Men reprint from May, 1962. The Golden Age Flash piece was probably the most interesting of the three because of its uniqueness and and the fact that it was drawn by Carmine Infantino whose work was starting to approach the work he would do on the Silver Age Flash revival in a few short years. That being said, his work was still going to take some mega leaps in those years. The Quicksilver and Johnny Quick stories weren’t all that great, but nevertheless interesting to see from a historical perspective. Never was a big fan of The Metal Men and can only wonder why this so wildly out of context piece was included in the issue. So why two reprint issues in a row? Obviously any combination of writer/artist illness or production snafus could cause something like this, but there’s also one other tantalizing possible explanation. These two issues cover the time frame when an earth quaking, history making, comic industry shaking event was about to take place. Having gotten wind of the fact that a new, incredibly hip, game changing comic strip was about to show up promptly at its appointed hour to blow the dust off of comic strips and comic books aimed at the nation’s youth, I’m pretty sure that the wheels at DC decided that discretion was the bettor part of valor and that it was best to lay low and not try to have their decidedly unhip books compete directly with this new comics force. So the decision was made to put out reprint books and wait until the dust settled before offering any new material. Again, this is just pure speculation on my part, but, absent any contradictory information like actual facts, it’s the theory I choose to embrace. On March 27th, 1972, Funky Winkerbean took its place on the American comics page.